The West Chester Railroad is a tourist railroad along the beautiful Chester Creek Valley in Southeastern Pennsylvania. They offer a variety of nostalgic 90 minute train trips throughout the year. Don’t miss your last chance to enjoy the Summer Picnic Special on September 21, 2014. 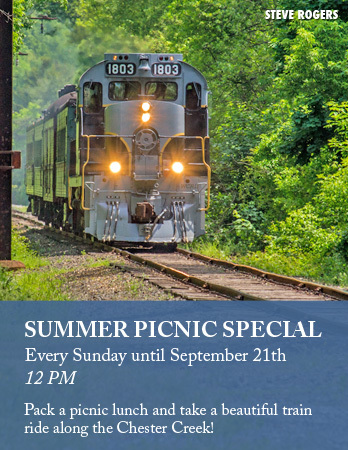 Make sure to pack a lunch for a 20-minute stop at Glen Mills train station picnic grove. For ticket information click here or visit westchesterrr.net. The West Chester Railroad is offering a special Mother’s Day Express on Sunday, May 11, 2014. Take your Mother on a relaxing picturesque 90-minute round trip train ride from downtown West Chester to historic Glen Mills Station. The train will depart at both noon and 2pm. All Moms ride for a special reduced fare, see ticket information at WestChesterRR.com or click here. Hop on board the West Chester Railroad and take a 90-minute round trip from downtown West Chester to historic Glen Mills Station along the beautiful Chester Creek. 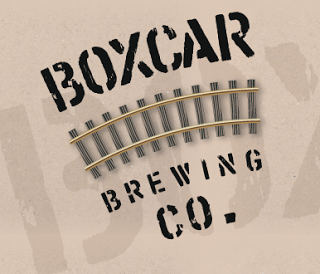 The train departs at both noon and 2pm. The Easter Bunny will be on board handing out treats to all passengers. Also, Greg Wright and Friends will be playing live music, singing all of your favorite Easter songs; they take song requests so don’t be shy! Make sure not to forget your camera because there will be plenty of opportunities for a photo with the Easter Bunny! See ticket information at WestChesterRR.com. West Chester Film Festival Coming this Month! 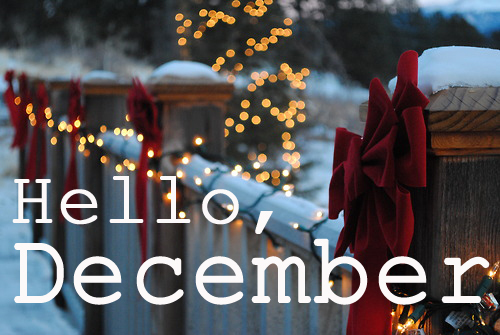 December is right around the corner and you know what that means? Santa is coming to town! Below are some events happening in and around West Chester that are perfect to enjoy with the entire family. 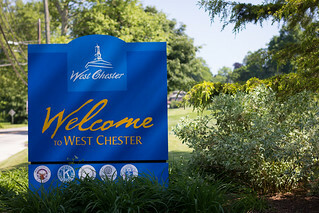 For more information visit http://www.downtownwestchester.com. Breakfast with Santa | Saturday, December 7: Enjoy a delicious buffet breakfast with Santa! Children will have a chance to sit with Santa, share their Christmas wishes, and take pictures with Santa (don’t forget to bring your camera). Limited seating, must pre-register. Download this registration form. Parking at Chestnut Street Garage. Call 610-436-9010 for more information. Buster seats and highchairs are not provided. Location: Chester County Historical Society, 225 North High St.
Meet Santa before the Christmas Parade | Saturday, December 7: Come downtown before the Old-Fashioned Christmas Parade begins and meet with Santa to share your wish list and have a picture taken (bring your camera). Santa’s Express on the West Chester Railroad: Families can join Santa for a 90-minute journey on the heated and decorated train through the Chester Creek Valley. Santa will be greeting everyone at Market Street Station and then going along for the ride to Glen Mills. Once at Glen Mills passengers can disembark and explore the historic station. There are plenty of photo opportunities on Santa’s lap inside the station. Remember your cameras! Upon return to West Chester, all passengers receive treats from Santa. Passengers will also enjoy the live music of Greg Wright and friends singing all of your favorite Christmas songs. They take requests so don’t be shy! See more information at WestChesterRR.net.